Are you hosting a Thanksgiving meal, or are you taking your dog with you to a Thanksgiving celebration? Here are some tips to make sure that your dog (and you) have a safe and happy Thanksgiving. Thanksgiving can be an exciting day for dogs, especially with lots of new people and delicious food around. Even if your dog isn’t overly excitable, it’s a good idea to give your dog some exercise before the big event to tire them out and get rid of extra energy. A tired dog is (usually) a calmer dog. Cooking the Thanksgiving meal can be a little stressful. You may have several dishes cooking at the same time, and things will be going in and out of the oven. Having a dog underfoot during this time can be dangerous for you and the dog. Plus, with all the food and good smells, your dog may be tempted to countersurf (sniff at the edge of the counter or even jump up). If you have an SSD dog and they know the “go to bed” cue, this could be a great time to practice. Put your dog’s blanket or bed in an out-of-the-way spot and have them lay down on it and stay. If you have a tiny puppy, this may be a good time to practice some crate time. Although our SSD dogs have stricter boundaries and rules than most pets, it’s a good idea to let your guests know the rules for your dog, regardless of whether you have an SSD dog. For example, SSD dogs need to calmly greet people, so guests should know to completely ignore the dog unless all four paws are on the floor and the dog is calm. Depending on the dog, you may want to leash them and have plenty of treats to keep their attention while guests are arriving. SSD dogs also should not get food from anyone but their puppy raisers. Let your guests know that they shouldn’t slip the dogs any turkey or other food. If you need something to keep your dog occupied during the meal, you can prepare a special treat beforehand to keep them busy. Try stuffing a marrow bone or a Kong with pumpkin, bits of turkey, dog food, and green beans and freeze it. By keeping an eye out for stress signals and helping your dog stay calm, you’ll make the holiday enjoyable for your dog, and you. An Important Question: Why Breed Service Dogs When You Could Rescue? We have received a lot of questions lately about why we breed dogs to become service dogs when there are so many dogs in shelters looking for good homes. This is an excellent question, and it’s one that we’ve given a lot of thought to over the years. In our early days, we used to rescue dogs from local shelters and humane societies to train as service dogs. There was a growing need for highly trained service dogs, however, and although we don’t like seeing any dog in a shelter, we were unable to meet that need by training rescue dogs. Twenty years ago, we discovered that there were very few dogs in shelters that would be suitable for service dog work, and today, there are even fewer. We mostly train Labrador Retrievers, and while we understand that there are many labs in shelters, especially black labs, very few of these dogs could become service dogs. When we were searching for rescue dogs, we often found that the dogs that met our temperament, age, and health requirements were the dogs that were adopted quickly. Not just any dog can become a service dog. The dog needs to have the right temperament, meaning they need to be calm with the ability to relax for extended periods of time, have no prey drive, and be willing to work. Service dogs need to be able to easily adapt to stress because they will be going almost everywhere with their person. They need to be able to stay calm around crowds, loud noises, strange surfaces, other animals, and more. Most importantly, they need to be able to continue to work despite the distractions around them. We met many lovely dogs when we were searching the shelters, but very few of them could handle the stress of working in public. The dogs also need to meet certain health requirements because we cannot place a dog with a person if that dog has health issues or a high probability of developing health issues in the future. All of our dogs have their hips, elbows, and eyes checked, and they’re screened for several genetic diseases. Our goal is to provide people with a healthy, highly trained service dog that will be able to mitigate a variety of disabilities. We do not want to give someone a dog that will need to retire in 2-3 years, nor do we want to provide a dog that is going to require expensive vet bills, which the person may not be able to afford. We want people to have a dog that will be able to safely and comfortably work until they’re 9-11 years old. The breed of dog that we train is also very important to us. As we mentioned, we usually train Labradors Retrievers. We also occasionally train golden retrievers and standard poodles. Although there are many reasons we use these breeds, one of the biggest reason is the public perception of these types of dogs. The public perceives labs to be very friendly dogs, which makes people more apt to interact with the person holding the leash. And that’s key. Our goal is for the service dog to help their person interact with the community and make new friends. By breeding service dogs, we have more control over the dogs’ temperament and health. In fact, we recently joined the AssistanceDogs International North America Breeding Cooperative, which gives us access to expert advice on breeding. There is a lot of research that goes into each individual breeding that we do. We look at the individual dogs, as well as their history, and if they have had puppies, we also look at the puppies. Our goal with each breeding is to improve the genetic line and the quality of service dogs that are produced. We never randomly breed any of our dogs. If one of our broods is in heat but we can’t find a suitable stud, we will skip that heat cycle rather than breed her to an unsuitable stud. All of our breeding dogs live in family homes, and when they’re not breeding, they have jobs, which allows us to see the dog’s actual potential as a service dog. Some of our broods and studs work as demonstration dogs, visiting groups and organizations to demonstrate what service dogs can do. Others work as interview dogs where they show people who have applied for service dogs how a dog can help them. All of our puppies are born in the homes of our volunteer breeder caretakers (although some puppies have been born at the vet or en route to the vet). We monitor the puppies and the mother very closely. From the time the puppies are born, we begin preparing them to become service dogs. Every day until the puppies are 18 days old, we do early neurological stimulation (holding the puppy on its back, holding the puppy vertically with its head up, holding the puppy vertically upside-down, tickling between its toes, and placing the puppy on a cold towel). This early neurological stimulation makes the dogs more adaptable to stress later in life. We also make sure we provide plenty of toys and other objects for the puppies, so they can play and start solving problems. If you watch our puppy cams, you’ll see all kinds of toys in the whelping box. All of this adds up to highly intelligent dogs who are highly adaptable to any situation—very important traits in a service dog. Our broods have several litters and then they are spayed and retired. Our broods will never continually have puppies for their entire lives. Depending on the age of the dog at retirement, they may be trained as a working service dog or they may be adopted by their breeder caretaker family or another family. In fact, any dog that does not make it through our program is adopted or finds another job. Our dogs never end up in shelters. We will find another job for the dog, such as with the CIA, ATF, or state police, or we will find a loving family home—and we always try to match the dog and the family. Similarly, if one of our partners is no longer able to care for their service dog for whatever reason, we will take the dog back and find it a new home. It was a tough decision to decide to breed rather than rescue, but it was necessary if we wanted to provide high quality service dogs for people with disabilities. Bobcats, Alligators, Elk, Oh My! Bobcats, alligators, elk—these are just some of the animals that SSD Irwin saw when his puppy raisers took him to Zoo America. He also saw lynx, ocelots, marten, and lots of birds. He was especially interested in the wolves and watched them from across the park for a long time. During our annual Zoo America outing, we used to take the dogs down to the wolves’ viewing area. However, the wolves had begun to get very agitated when they saw the dogs, even though most of the dogs simply looked at them. We try to be mindful of our own dogs and the other animals, and if either one get too worked up, we leave the area. Every Tuesday, Irwin goes to the bowling alley in Elizabethtown, where he gets to experience the bowling alley itself and the attached restaurant. He also went to a Hershey Bears hockey game and did a great job handling the noise, crowds and food distractions. Irwin recently had his 12-month evaluation. During evals, he stayed in the kennel for two nights so that our training staff could see how he handled kennel life. Twelve month evaluations are one of the mile markers in a service dog in training’s life. Most of our dogs in training enter advanced training when they’re 18-24 months old, which means that Irwin is about halfway through his journey to becoming a service dog. SSD Lexington arrived at SSD in early October. Lexi is a little black lab from KSDS, Inc. Assistance Dogs in Kansas. One of our volunteers, Robin, drove down to Kansas to pick her up, and these are her adventures. This is really the story of me needing a change of scenery. 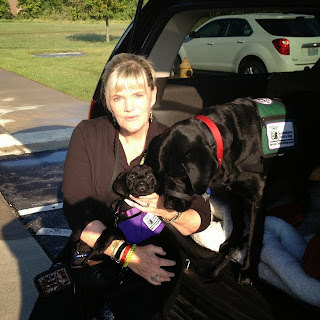 I woke up to an email from Nancy Fierer [SSD’s director] about picking up a puppy in Kansas City. I took a look and thought, Wow, what great timing! Nancy had sneakily thrown in the word “adventure,” and I was hooked. Amanda [SSD’s training coordinator] put together a “puppy pack” and gave me the information about KSDS, Inc. to make the necessary arrangements. This will be a piece of cake, I thought, thinking I would be home in 3-4 days. Lots of packing everybody up. SSD Aladdin and Tomme the Papillon were also coming. I had the good luck of having my close friend Jonathan agree to come along. 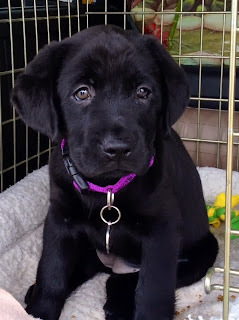 (I had sort of simplified the whole idea—a long Sunday trip to pick up an adorable puppy and back we would come!) Since I’m selling my car and didn’t want to put more miles on it, I decided to rent a big Suburban to fit all our stuff. We just fit. Well, I was a bit taken aback on how to answer that one, but I did thank him for the compliment. That night, we stayed in a national chain hotel, so asking for a room on the first floor near an exit wasn’t a problem. While Jonathan signed in, I drove the rest of our entourage to the hall door, and we would start uploading the car: dogs, crates, blankets, and all the dog stuff. We always bring a blanket to cover the bed, too. The housekeeping staff were amazed at how good and polite our dogs were. Repack, rerun, and more junk food for the humans. We made it into Missouri and passed the Gateway Arch. The miles and hours were beginning to drag a bit. How much farther to Kansas City? We checked our directions and found an email from SSD saying that our destination wasn’t exactly in Kansas City. It was a small town north of Kansas City near Nebraska, only 350 miles more. We were on a long straight road called the Pony Express Highway, which is a historical route. Periodically in the distance, we could see a life-size metal sculpture of a horse and rider galloping across the plain. We introduced her to her new travel mates and she immediately fell in love with Aladdin. Six-pound Tomme, our grumpy old man, just growled for her to stay away, and she left him alone. Within a day, she was running to come for a treat and loving when she was called. Now the fun really began. No more sleeping through the night. We had to take her out to potty every few hours. By the end of our odyssey, she was sleeping six hours without needing to go out. She would play with her little toys that we had brought for her, pounce of Aladdin (which was fine with him), leave Tomme alone (which was fine with him), and go into her crate to sleep. She cried a little bit, but I would ask Aladdin to lie next to the crate, and Lexi would sign and conk out. It worked beautifully. We humans were beginning to wear down, but the dogs just adapted. Homeward bound! Walking three dogs drew a lot of attention, especially the large and tiny Labradors in their service dog harnesses. 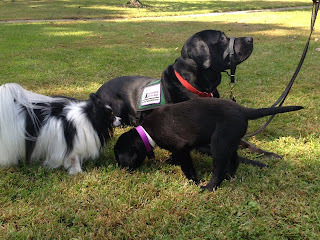 We educated people about service dogs and continued on our way. The junk food and lack of sleep and exercise were getting to the humans. The entire trip was about 3000 miles, and we were ready to call it over. Turning Lexi over to SSD, though, was another thing entirely. You bond so quickly to a creature as sweet, smart, mellow, and dear as this one. She spent more of her trip in her snuggly crate and the rest of the time sleeping on my feet in a puffy blanket, with lots of stops in between for potty breaks. Thank you so much to Robin for picking up Lexi and bringing her safely to her new home! The Assistance Dogs International North American Trainer’s Conference, hosted by Pacific Assistance Dogs Society (PADS) in Vancouver, British Columbia, Canada, was wonderful. It was full of diverse material with something interesting for everyone. PADS arranged for the conference to be held at the Rosemary Heights Retreat Center just outside Vancouver. We had wonderfully comfortable beds, great food, and beautiful grounds for walking. Many attendees arrived on Sunday evening (Oct. 6) to settle in, and there was a dinner and later a wine and cheese reception. It was great to see old friends and greet new ones. In addition to me, there were three other people representing SSD at the conference: Amanda, our training coordinator; Becky, our puppy coordinator; and Susan, our volunteer extraordinaire. SSD Julia, one of our yellow lab breeding females, also came along. On Monday morning, we had a great session about courthouse dogs. Celeste Walsen Ellen O’Neill-Stephens, and CCI Molly B gave a wonderful presentation about what they do, how it works, and some of the wonderful successes they have had. Kim Gramlich with PADS Caber from the Delta Police Department spoke about the use of a specially trained dog in police-based victim services. The dog provides emotional support and aid during crisis intervention and response. The dog is a very effective tool, often giving “permission” for emotions that are under the surface, which allows the healing process to begin. This was a different type of facility placement from an ADI program than I had seen before. I found this session to be very informative and professional. The women from the Courthouse Dog Foundation stress how careful and thorough the training and placement must be for courthouse dogs because these dogs are now part of making case law to smooth the way for future courthouse dogs. There are now fifty of these facility courthouse dogs working in twenty-one states. The third part of this session concerned the placement of facility dogs by PADS in a child protection center. Here again, professionalism was stressed. Margaret Hicks, PADS training manager did another great job with this final presentation. After lunch, Susquehanna Service Dogs “Make the Right Match,” a presentation about matching people with dogs. 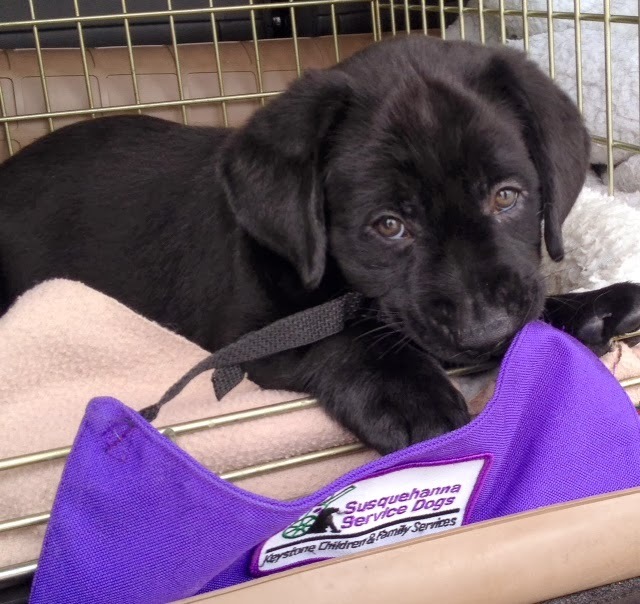 Rebecca Lamb, our puppy coordinator, began by discussing the extensive process each potential puppy raiser must go through before we match the puppy with the raiser family. I gave a brief overview of the application process for people who are applying for service dogs, targeting the areas where we gather information for the future match, as well as information to measure how well the service dog team is doing six months after placement. Amanda Nicholson, our training coordinator, talked about the process of matching a person with a service dog. She discussed the questions we ask each person before they meet the dogs, which are used in outcome measurements and to create a list of behaviors and tasks needed to mitigate the person’s disability. She listed all of the things we consider before matching a person with a dog, including some of the common pitfalls. We also consider the dog’s choice as well. There were many questions for us, since the information was new for some people. Next we had breakout sessions in three areas—Diabetic Dogs Panel, Starting a Courthouse Program, and a Breeding Program Managers session. I attended Starting a Courthouse Program, since we recently placed our first courthouse dog (SSD Buster). This session was very informative, and people made specific and systematic suggestions. The evening was another fun time. Everyone shared funny and embarrassing moments involving service dogs in their lives. Marina Hall Phillips won the prize for the funniest, and I still laugh thinking about it. Tuesday, October 8 was a day full of serious breeding discussions. In the morning sessions, Marina Hall Phillips discussed the ins and outs of managing a productive and sustainable working dog breeding colony. She stress the importance of knowing your production value and the significance of data integrity and phenotype, as well as what tests we need and why. In February, SSD had hired Marina to visit our program for three days to help evaluate our needs. Much of the information in this session were things we learned from her visit and the follow-up report we received. The session was a comprehensive overview and a great reminder for us to help keep us on track. This was an awesome presentation! That afternoon, Marina moderated a panel discussion with presenters from PADS, SSD, Indiana Canine Assistant Network (ICAN), and British Columbia Guide Dogs. The audience had lots of questions. In the evening, the potential males from PADS were assessed. We discussed the issue of looking at the dog as an individual vs. the big picture. How much weight is given to the individual and what other important considerations need to be taken based on the dog’s pedigree? We also discussed the importance of weighing the dog’s faults and merits and not letting “perfect” be the enemy of “good.” Finally, we looked at pre-breeding management of broods and studs. It was a long but interesting exercise. Wednesday, October 9 brought a slide and video presentation by Joey Iverson about Behavioral Adjustment Training (BAT). The presentation showed the systematic approach to using BAT to rehabilitate dog reactivity by examining why the dog is reactive and helping the dog meet their needs in other ways. BAT is a dog-friendly application of functional analysis that gives the dogs a chance to learn to control their own comfort level through peaceful means. I really enjoyed this presentation made it clearer to me how SSD can improve the way we use BAT. I find BAT helpful for reactivity for puppies and young dogs, but not necessarily for addressing aggressive behavior. In the afternoon, we listened to a presentation by PADS puppy raising supervisor Heather Kidd on Footfall Techniques. She came up with the idea after working with her horses. She feels that if you teach the pup efficient footwork as puppies, then they will be able to become more confident as adults. They are able to move more efficiently and also be more confident that their feet will move them where they need to go in times of stress. Heather demonstrated that confidence in a wonderful video of a PADS dog and a ramp. I think the footfall techniques are something that SSD will start teaching. It’s easy, fun, and may be very helpful in the future. We then had a hands-on workshop with BAT and footfall techniques, which was nice for the last day. Most of the attendees returned home on October 10, but we decided to take advantage of the visit to PADS and the trip to Whistler BC. It was a beautiful day, with wonderful scenery, great company, and a reminder of how proud Canadians are of their wonderful country! Welcome SSD GDQ Eva from Australia! Give a warm welcome to Eva! Eva just arrived from Guide Dogs Queensland in Australia, and she’s going to be making her home with Susquehanna Service Dogs. She flew across an ocean and a continent to get here, accompanied by GDQ’s CEO, Chris Laine. 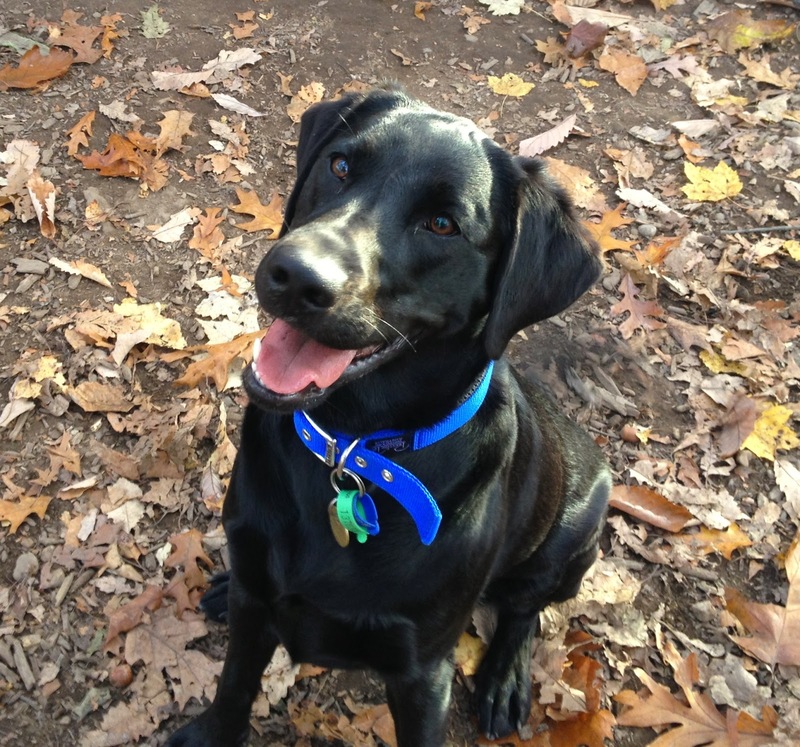 Eva is a sweet 14-month-old black lab, who has been fully trained as a guide dog. Because of her particular traits and genetics, she was chosen to become a breeding dog. 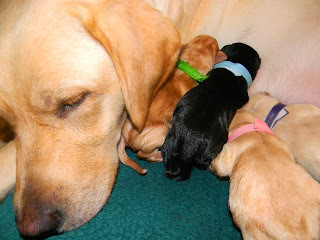 Eva will be having several litters of puppies who will become service dogs. Will you support Eva and her future puppies? From now until January 6, 2014, we’re holding an online fundraiser, and our goal is to raise $3,300 in support of Eva. Your donation will make it possible for Eva and her puppies to change people’s lives. We’re very excited to have Eva! She’s a special dog, and not only because she had to travel so far to get here. 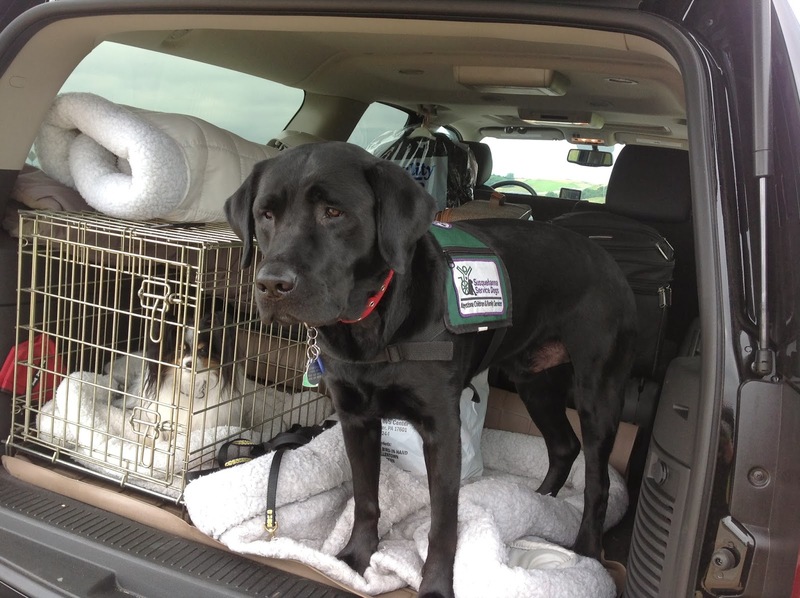 Eva is part of the Assistance Dogs International North America Breeding Cooperative (ABC), which we are a part of. ABC is a group of service dog organizations throughout North America who are dedicated to developing high quality service dogs. Each of us assign our best broods (females) and studs (males) to the co-op. When we whelp a litter, half of the puppies stay with us and the other half will be distributed among the other members. What does ABC mean for SSD? It means that we will always have a supply of puppies, which in turn means that we will have dogs to train as service dogs who will ultimately change people’s lives. Even more importantly, the quality of these dogs will be higher because ABC helps strengthen genetic lines and create dogs who are best suited to service dog work. That’s where Eva comes in. Guide Dogs Queensland has spent many years developing their genetic lines. Now that Eva has joined SSD, she will help us produce dogs who are even better service dogs. Please support SSD and Eva by donating online. Your donation will help change lives. Roulette, craps, black jack, Texas Hold’em—the green felt tables were full by the end of the night at Lucky Dog Casino Night. This year, instead of our traditional Black Tie & Tails dinner dance, we decided to hold a casino night. We had a blast, and we hope our guests did, too! The Sheraton Harrisburg-Hershey was decked out for the night with cards, dice, and poker chips. The evening started with a reception. Guests chatted and perused the silent auction items ringing the room. This year, there were over 60 items for guests to bid on, including a beautiful wreath, dog gift baskets, stunning jewelry, a designer scarf, and luggage filled with board games. We all enjoyed a delicious dinner of Chicken Wellington, with vanilla ice cream and cookies for dessert. After dinner, we auctioned off a beautiful hand-stitched quilt; Fruity Drink Night at the home of our director, Nancy; puppy naming rights, and of course, a vacation in Las Vegas. The gaming tables opened up after that. Each guest was given a voucher with chips and soon some guests had piles of colorful chips stacked in front of them. At the end of the night, the four people with the most chips received prizes: a wine tasting trip for 12, a designer dog bowl and brush, a lovely woven blanket, and an SSD sweatshirt. Thank you to all of our volunteers who helped set up and make sure the evening ran smoothly. And a special thank you to all of our volunteer casino dealers!